Blurb: Once the country believed itself to be the true face of Australia: sunburnt men and capable women raising crops and children, enduring isolation and a fickle environment, carrying the nation on their sturdy backs. For almost 200 years after white settlement began, city Australia needed the country: to feed it, to earn its export income, to fill the empty land, to provide it with distinctive images of the nation being built in the great south land. But Australia no longer rides on the sheep's back, and since the 1980s, when 'economic rationalism' became the new creed, the country has felt abandoned, its contribution to the nation dismissed, its historic purpose forgotten. 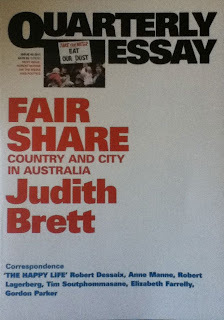 In Fair Share, Judith Brett argues that our federation was built on the idea of a big country and a fair share, no matter where one lived. We also looked to the bush for our legends and we still look to it for our food. In late 2010, with the country independents deciding who would form federal government, it seemed that rural and regional Australia's time had come again. But, as Murray-Darling water reforms shows, the politics of dependence are complicated. The question remains: what will be the fate of the country in an era of user-pays, water cutbacks, climate change, droughts and flooding rains? 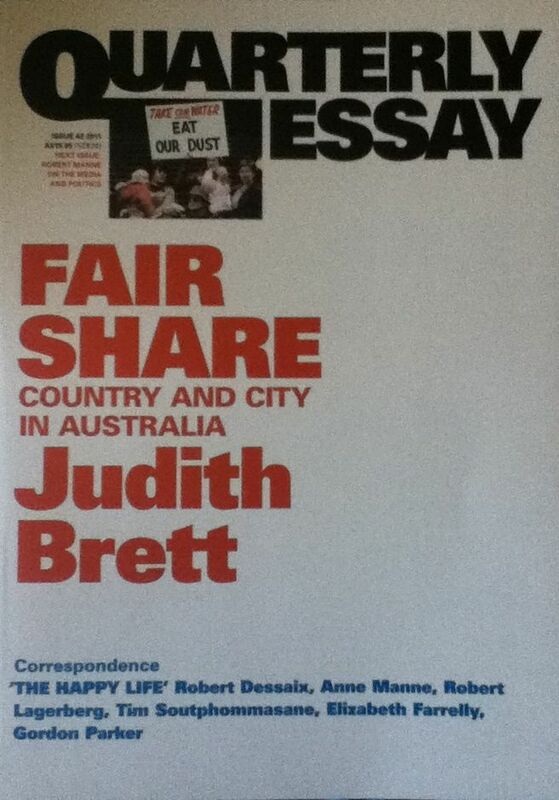 What are the prospects for a new compact between country and city in Australia in the twenty-first century?